As must as it hurts me to admit it, this summer is really flying by. Back-to-school season is right around the corner and it often creates tension among most parents who tend to scramble around trying to afford everything their kids need for the school year. Summer is usually an expensive time in my household because we like to get out and enjoy the weather, take trips, and start saving for the holidays later in the year. I didn’t get my son hardly any clothes this summer as I felt it was unnecessary and he could still fit most of his clothes from last year. Instead, my money went to summer camp and other activities. However, I know we’re going to need to buy some more fall clothes and shoes before school starts so I’m budgeting for that. Parents in the U.S. spend an average of $500 on back-to-school clothes and supplies for per child. Spending that type of money is not in the cards for me, which is why I’m at least trying to obtain all my son’s school supplies for free. Yes, I want to spend $0 on school supplies this year. Here’s how I’m going to try to make it happen. One of the best things you can do before running out to buy more school supplies is check to see what you already have. So many parents end up skipping out on this quick little activity and end up paying for it dearly. I used to run out and buy glue sticks, pencils, pens, paper, and folders each year only to come home and realize I already had a lot of that stuff. Some of it was still new and in the package from last year. If you’re trying to stick to a budget or spend close to nothing on school supplies like me this year, you definitely want to comb through the house and make sure you uncover any school supplies you already have. Once you can confirm the items you already have at home, cross them off the list. This is one of my favorite ways to get free school supplies. Some community organizations will arrange free back-to-school events for kids. It’s a fun way to get excited about the upcoming school year as there’s usually food, activities, and entertainment at the event. At an event I attended in my areas a few years ago, there was a bounce house, a food bank handing out fresh food, and even a barber giving kids free haircuts. Another cool perk was that there were passing out free school supplies and book bags to kids. We were grateful to receive whatever they had as it saved us a ton of money. If your kids need more specific supplies whether it be special calculator and protractors or color-coded binders, see if you can organize your own school supplies swap. Ask all your neighbors, friends in the area, and members at church to meet up one day with their kids and bring all the leftover school supplies that they no longer need. Then, swap items so everyone walks away with something that they need for the upcoming school year. This works great when kids from all different age groups participate. For example, an older kid going into middle school may have items they no longer need that a 5th or 6th grader can use. Going out into the community is a great way to connect with others and share resources. It’s best to schedule the swap before people start doing their back-to-school shopping and getting reorganized. At the end of each school year, I go through my son’s backpack for papers on the final day but I never look through his supplies and toss things out until we start getting ready to go back to school in August. Signing up for coupons and rewards at your favorite stores is worth a try around the back-to-school season. Some stores run special offers include buy-one-get-one free deals or will even allow you to earn rewards and freebies year-round that you can cash in to get free and discounted school supplies. I personally don’t like signing up for a ton of programs but if you do your research, you can narrow down the best ones and just unsubscribe mailing lists after the back-to-school season. This is one of my favorite ways to score free school supplies. I have a cash back credit card that I use to buy gas and groceries. At the end of each billing cycle, I pay my bill in full and receive a cash back credit to my account. I almost always choose to redeem my cashback via direct deposit. This year, I have over $100 saved so far and I plan to put some toward my Christmas savings fund and some toward school supplies should I need it. You can plan to earn cash back all year round and if you don’t want to use a credit card, I’d recommend trying Ebates which pays you cash back for regular online shopping. Don’t want to spend hundreds on school supplies? Luckily, you don’t have to. 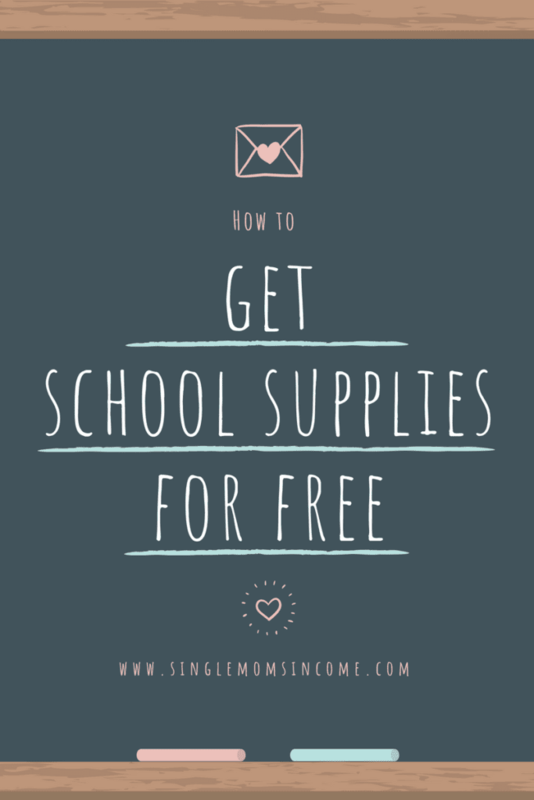 Obtaining free school supplies is definitely possible when you utilize these tips and plan accordingly. Do you set a budget for school supplies? Do you already use any of the hacks mentioned here or have something to add? This post has shared useful methods for get school suppliers for free. I like the post very much. I hope that every child can apply their dream school. I try to go to our local church that hosts this for supplies, but i will start shopping as soon as the lists come out after going through what i have and i will gather a little here and there when they are on sale. I also shop secondhand stores for clothes especially when they are having a sale. I search and have found some name brand items with the tags still on them.